The test tab lets you send and display emails generated with the settings you've entered on the first three tabs. Note: in order to use the test option, there must have been at least one submission in the database. The test functionality simulates a "real-life" case by using the data in one of your submissions. 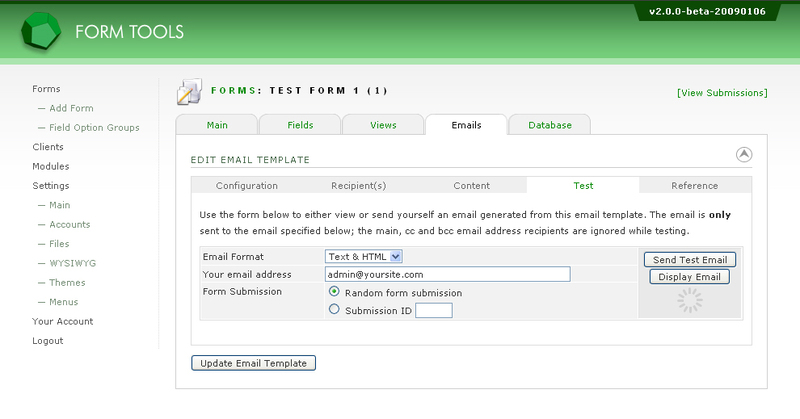 To test your email template, enter the email format to test (HTML, text or both), your email address and a submission ID (either by ID or by clicking the "random" option). The Display Email button displays the email content in the page. This can be a little more convenient than actually sending the email, since you don't have to go fishing around in other programs looking for your email. That said, nothing beats sending the actual email to see how it looks. The various headers (from, reply-to, cc and bcc)) are only displayed in the page. The Send Test Email does just that: it sends the email to the email address specified. Web servers send emails in different ways. Some of them send them immediately, others cache them and send them in a batch at various intervals over the course of a day (I encountered one once that only sent out emails once a day!). If you don't receive your email immediately, you may want to wait for a few hours to see if it arrives. If you don't receive your email within the expected time, check your spam folder. If you have installed and configured the Swift Mailer module, emails sent with this test facility will be sent via SMTP instead of with the default mail() script. As mentioned in other places in the documentation, the PHP mail() function used by the default Form Tools installation is notoriously fickle. It's implemented differently for each web server, and some servers limit options like being able to send email in multi-part format (HTML + text at the same time). If you have trouble getting it running, you may be interested in the Swift Mailer module.